CROS and BiCROS Hearing Solutions – A way to hear both sides of the story. These devices are an excellent solution for individuals who are deaf in one ear and who hear normally in the opposite ear and for individuals who are deaf in one ear and have a hearing loss in the opposite ear. Many people are deaf in one ear or have very poor hearing in one ear. For years, they have gone through life only hearing half the story. They are unable to hear from their “bad” ear. Typically, they try to position themselves so that conversation is always on their “good” side. Without two working ears, your brain has difficulty locating sounds like police and fire sirens or phones ringing. Often, this is frustrating and tiring. Until recent years, the solutions to this kind of hearing loss were more frustrating than not hearing. Patients could choose from options that included wires hanging behind your head that connected hearing aids on each ear or giant hearing aids on both ears. 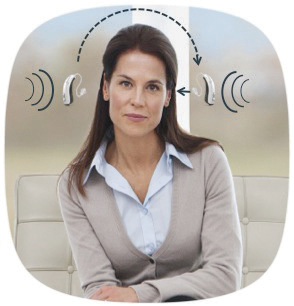 Today, Tustin Hearing Center is able to offer discreet and personalized solutions from multiple manufacturers. With a CROS or BiCROS hearing aid listening to and participating in conversations, even on your “bad” side, is made easy. When visiting with friends while attending a play or talking to your grandchildren in a crowded restaurant, you can follow along and even enjoy the conversation, regardless of what side the speaker is located. Simply. Users wear the CROS (a microphone) on your deaf or “bad” side like an ordinary behind-the-ear hearing aid. It picks up the sounds on your “bad” side and transmits it over to the hearing aid on your “good” side. If you have a “bad” ear and want to try hearing the story from both sides, call Tustin Hearing Center and schedule your complimentary hearing screening and consultation today!